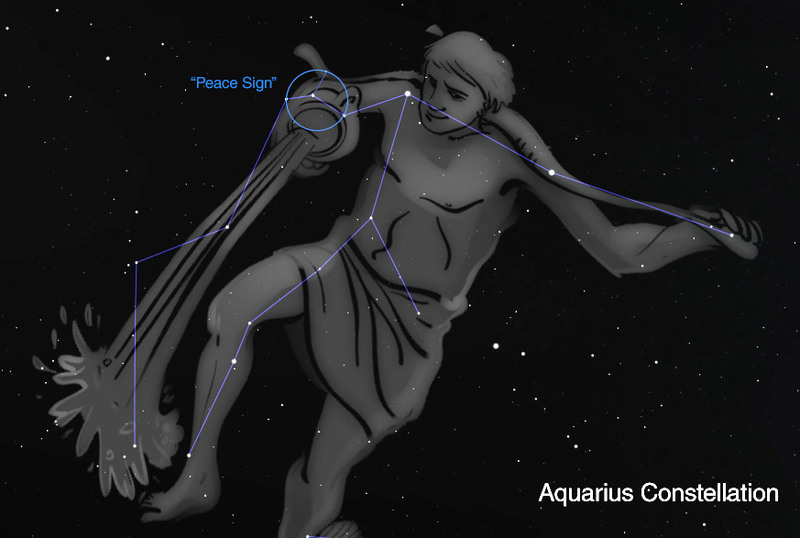 The eta Aquariids (ETA) are active between April 19 and May 28. The strongest activity is usually seen near May 6, when rates can reach 25-30 meteors per hour as seen from the tropical areas of the Earth. 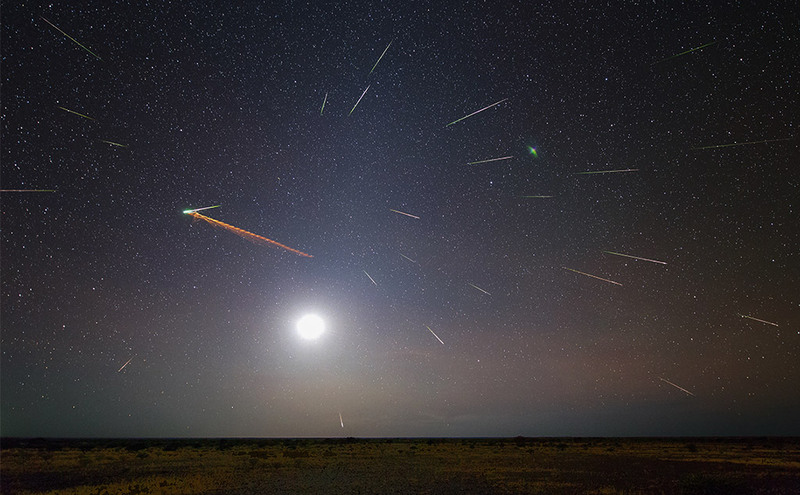 Unlike most major annual meteor showers, there is no sharp peak for this shower, but rather a plateau of good rates that last approximately one week centered on May 6. The eta Aquariids are particles from Halley’s Comet, which last passed through the inner solar system in 1986. The meteors we currently see as members of the eta Aquariid shower separated from Halley’s Comet hundreds of years ago. 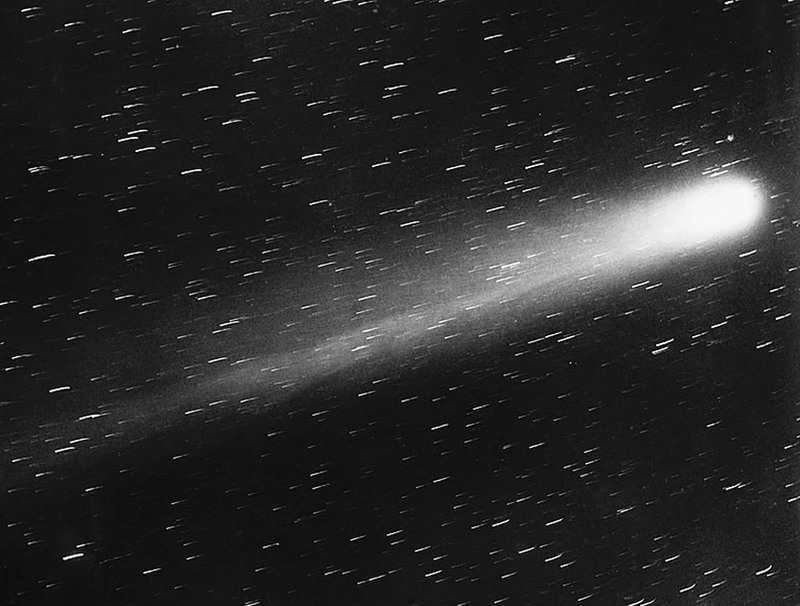 The current orbit of Halley’s Comet does not pass close enough to the Earth to be a source of meteoric activity. For most observers, the eta Aquariids are only visible during the last couple of hours before the start of morning twilight. The reason for this is that the radiant is situated approximately sixty degrees west of the sun. Therefore it rises before the sun in the morning hours. The time of radiant rise is between 3:00 and 4:00 local summer time, depending on your longitude. The real key is the latitude. There is an observing window for this shower between the time the radiant rises and the beginning of morning nautical twilight. This window ranges from zero at 60 degrees north latitude to all night in Antarctica. Unfortunately in Antarctica, the radiant never rises very high in the sky. The best combination of a large observing window and a decent radiant altitude occurs between the equator and 30 degrees south latitude. From this area the radiant reaches a maximum altitude of 50 degrees at nautical twilight. The observing window ranges from 3.5 hours at the equator to slightly over 4.0 hours at 30 degrees south latitude. Going further south will increase your observing window but the maximum altitude will begin to fall closer to the horizon. In 2017, the Moon will be a waxing gibbous phase when the shower is predicted to peak. Under this situation the Moon will be setting in the West while the radiant is rising in the East. Lunar conditions will be more favorable prior to maximum so do not hesitate to view this activity earlier in May. I would suggest starting observations as soon as the radiant is close to the horizon. 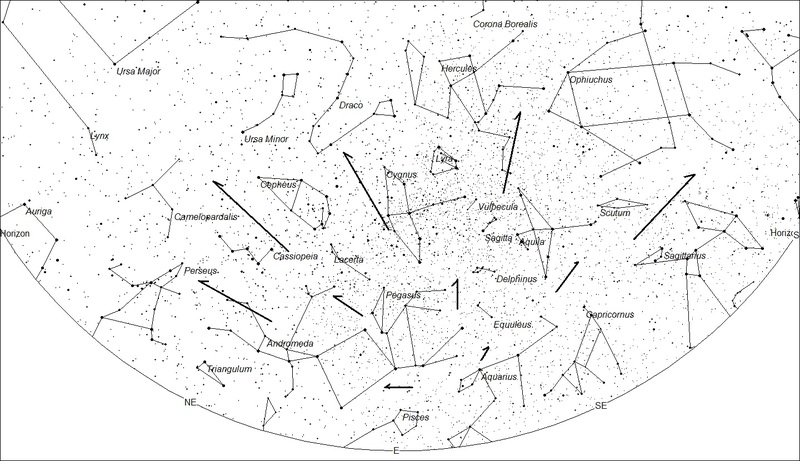 Activity from the eta Aquariids can be seen with the radiant located just below the horizon. Rates will be low but any meteors you do witness will be memorable as they will be very long and long lasting. These meteors are called “earthgrazers” as they just graze the upper atmosphere under these conditions. As the radiant rises higher into the sky these meteors will become shorter and of less duration, but more numerous. To see the most activity observe after the radiant has risen and look approximately half way up in the sky toward the east. If this direction is heavily lit with light pollution then switch closer to the north or south. 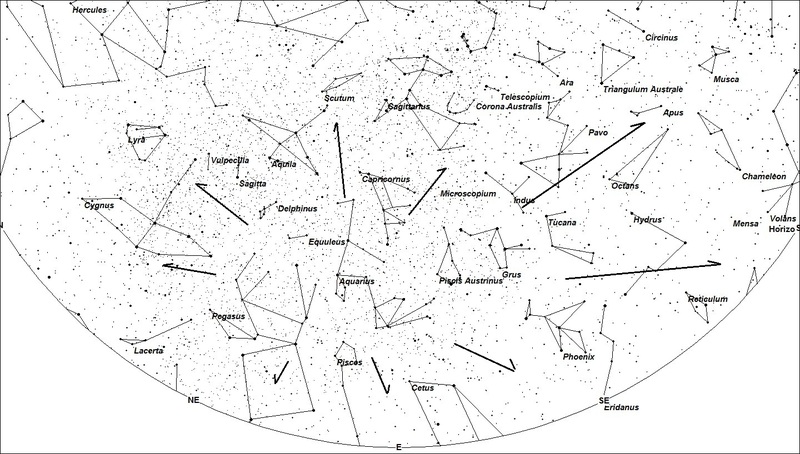 If facing east the eta Aquariid meteors will enter your field of view from the bottom. If facing north then they will enter from the right and facing south they will enter from the left. Meteors moving in any other direction would be sporadic or those belonging to a minor shower active at this time. Observers in mid-northern latitudes (45N) can realistically expect to see 5-10 eta Aquariids during the last dark hour before dawn. This rate will increase if you are located further south and decrease as you move northward. This year, Mikhail Maslov predicted enhanced eta Aquariid activity on May 4th, 14h- 18h UT, as the Earth may come close to a dust trail released by 1P/Halley in -616. But according to Mikiya Sato, who formerly predicted the 2013 eta Aquariids outburst (ZHR ~ 120 instead of 60-80 due to the crossing of numerous dust trails), 2013 forceast may not be that optimistic. First because we will cross one single dust trail (compared to numerous one in the 2013 configuration). 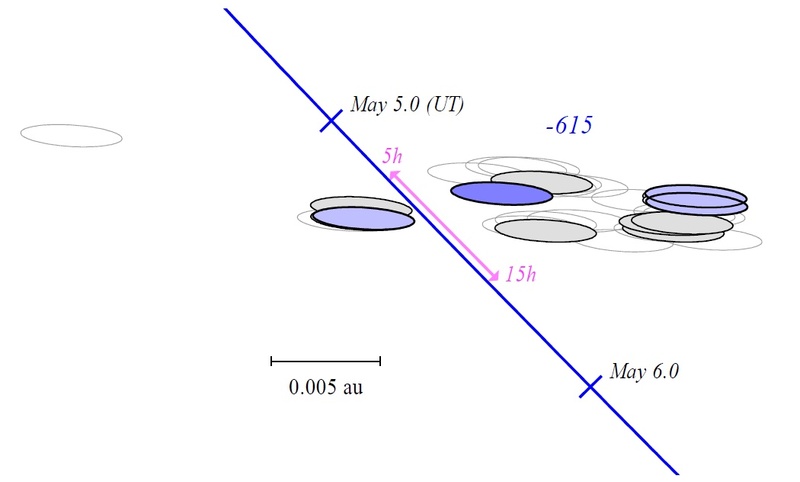 Second because we may not approach the -616 dust trail that close: according to Mikiya Sato, the activity increase in 2017, if any, should occur on May 5th, 5-15h UT, and should not be strong enough to be detected. See also the discussions on this topic on the IMO Forum. If you would like to contribute more to our knowledge of the eta Aquariids, then I invite you to get serious about meteor observing and to make an hourly count of the activity you witness. Be certain to at least separate the eta Aquariids from other meteors. It is also interesting to look for the Anthelion meteors and for members of the eta Lyrids, both are weakly active during the eta Aquariids. 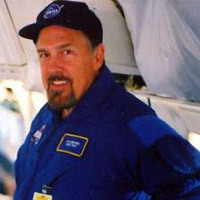 Other more detailed projects include the estimating the magnitude, velocity, and color of each meteor. Others also note whether there was a persistent train after the meteor has vanished. Meteor watching can be both fun and scientifically useful endeavor. 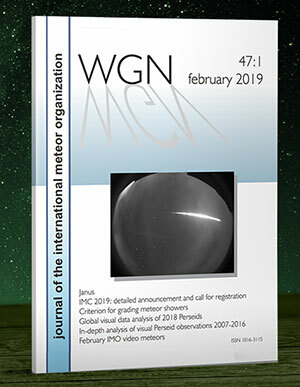 To be scientifically useful you must share your data with an active meteor group such as the International Meteor Organization. Entering data is now easy using our online observing report form to share your data. You can also see what other observers have witnessed by visiting the IMO web page dedicated to the eta Aquariids 2017 campaign.